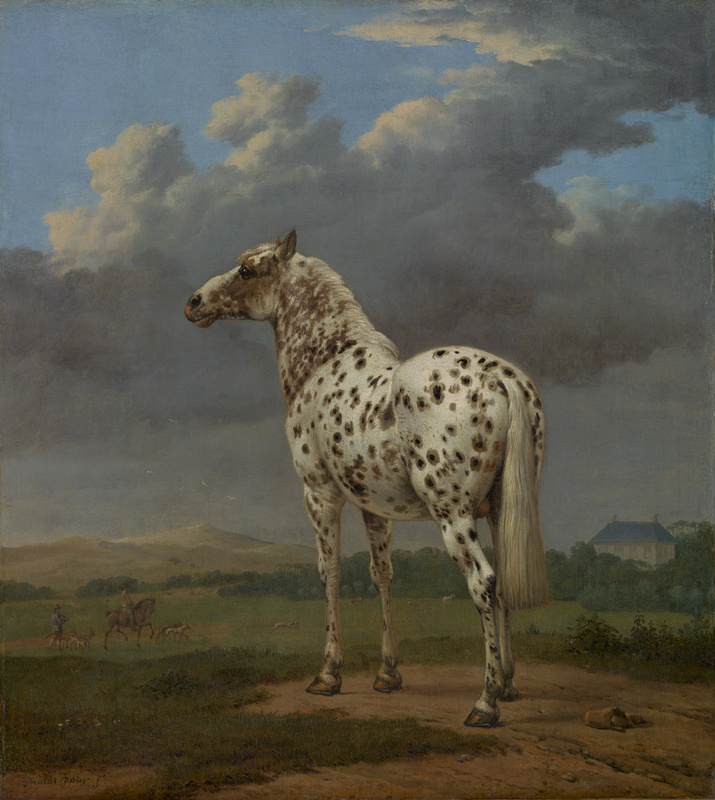 Lower left: "Paulus Potter f."
Silhouetted against rolling, stormy, clouds, a gray, spotted horse stands, turning its head slightly to suggest its alertness to its surroundings. Paulus Potter, the finest Dutch animal painter of his day, described the horse with scrupulous attention to physical detail: the glossy sheen of its coat and mane, the watery moistness of its eye, and the sleekly elegant lines of the animal's body. At the same time, the artist imbued the horse with an individualized personality that combines wildness with acute sensitivity. Indeed, the animal seems to respond to the distant sound of the hunt transpiring in the middle distance. The meaning of the painting is twofold. It is probably a horse portrait, perhaps commissioned by the owner of the country house at the right. The closely observed rendering of this domestic animal implies the pride of ownership that a wealthy Dutch landowner might have taken in the possession of such livestock. On the other hand, the horse is untethered and seems to roam free. His immaculate grooming and position before cultivated fields, however, imply that the source of Dutch prosperity lay in the control that humans were able to exert over brute nature. Possibly Johan Aegidiusz van der Marck, 1707 - 1772 (Leiden, The Netherlands), upon his death, probably held in trust by the estate. Source: According to Le Brun sale 1811, lot 129 (description). Possibly Estate of Johan Aegidiusz van der Marck, 1707 - 1772, probably sold to Jean-Baptiste-Pierre Lebrun by private treaty sale, 1773. Source: annotated 1787 auction catalogue (RKD). Pieter de Smeth van Alphen, heer van Alphen en Rietveld, 1753 - 1809 (Amsterdam, The Netherlands), upon his death, held in trust by the estate. Martin H. Colnaghi, 1821 - 1908, sold to Charles Sedelmeyer, March 9, 1896, for £600. Source: Michael J. Ripps. "Bond Street Picture Dealers [...]." Ph.D. diss. (University of Oxford, 2010), p. 47. Charles Sedelmeyer, 1837 - 1925 (Paris, France), sold to Adolphe Schloss, May 26, 1896, for 20,000 francs. Source: Michael J. Ripps. "Bond Street Picture Dealers [...]." Ph.D. diss. (University of Oxford, 2010), p. 107. Adolphe Schloss, 1842 - 1910 (Paris, France), by inheritance to his wife, Lucie Schloss, 1910. Lucie (Haas) Schloss, 1858 - 1938 (Paris, France), by inheritance to her children, Marguerite Schloss, Lucien Schloss, Henri Schloss, Raymond Schloss, and Juliette (Schloss) Weil, 1938. Marguerite Schloss, 1879 - 1959 (Paris, France; Château de Chambon, Laguenne near Tulle, France) and Lucien Schloss, 1881 - 1962 (Paris, France; Château de Chambon, Laguenne near Tulle, France) and Henri Schloss, 1882 - 1964 (Paris, France; Château de Chambon, Laguenne near Tulle, France) and Raymond Schloss (Paris, France; Château de Chambon, Laguenne near Tulle, France) and Juliette (Schloss) Weil, born 1885 (Paris, France; Château de Chambon, Laguenne near Tulle, France), looted by the Vichy Government of France, 1943. In the possession of the Vichy government of France (Limoges, France), sequestered by the French State Museums in the Musée du Louvre, Paris, 1943. Musée du Louvre (Paris, France), restituted to the heirs of the Adolphe Schloss Family, July 1946. Lebrun, Paris. Catalogue de tableaux capitaux et d'objects rares et curieux [...] de M. le Chevalier Lambert [...]. March 27, 1787, p. 53, lot 117. Schley, Philippus van der, et al., Amsterdam. Catalogus van het kabinet schilderijen nagelaten door [...] Pieter de Smeth van Alphen [...]. August 1, 1810, p. 33, lot 78. Lebrun, Paris. Vente d'une collection de tableaux capitaux et du beau choix, des trois ecoles [...]. April 16, 1811, p. 46, lot 129. Phillips, London. Gallery of Dutch, Flemish, and Italian Pictures [...] formed during the last thirty years by the Count of Pourtalès [...]. May 19, 1826, p. 18, lot 102. Smith, John. A Catalogue Raisonné of the Works of the Most Eminent Dutch, Flemish, and French Painters [...]. 9 vols. (London: Smith and Son, 1829-42), vol. 5 (1834), p. 137, no. 41. Westrheene, Tobias van. Paulus Potter, sa vie et ses oeuvres (The Hague: Martinus Nijhoff, 1867), p. 177, no. 11. Sedelmeyer Gallery. Illustrated Catalogue of the Third Series of 100 Paintings by Old Masters of the Dutch, Flemish, Italian, French and English Schools [...] (Paris: Chas. Sedelmeyer, 1896), p. 37, no. 27, ill.
Offizieller Katalog der VII. internationalen Kunstaustellung im kgl. Glaspalaste zu München 1897, exh. cat. (Munich: Rudolf Mosse, 1897), p. 33, no. 41. Hofstede de Groot, Cornelis. A Catalogue Raisonné of the Works of the Most Eminent Dutch Painters of the Seventeenth Century, Based on the Works of John Smith. Edward G. Hawke, ed. and trans. (London: Macmillan and Co., 1908-27), vol. 4 (1912), p. 649, no. 141. Galerie Charpentier, Paris. Collection de feu M. Adolphe Schloss (deuxième vente): Tableaux anciens. December 5, 1951, unpaginated, lot 44, ill.
Checkland, Sarah Jane. "Dutch Artist's Record Price." The Times [London] (June 2, 1988), unpaginated, ill.
Norman, Geraldine. "Heirs Battle for Renand Treasures." The Independent [London] (2 June 1988). Drouot Montaigne, Paris. Collection Georges Renand. May 31, 1988, unpaginated, lot 32, ill.
"Printemps a Drouot-Montaigne." La Gazette [Paris] (April 29, 1988), unpaginated, ill.
"Principales acquisitions des musées en 1988." La Chronique des arts: Supplément à la Gazette des beaux-arts, 6th ser., 113, no. 1442 (March 1989), p. 34, no. 186, ill.
"Un succès décrié." Connaissance des arts 437/438 (July-August 1988), pp. 22-23, fig. 3. Sutton, Peter C. "Recent Patterns of Public and Private Collecting of Dutch Art." In Great Dutch Paintings from America, exh. cat. Ben Broos et al., eds. (The Hague: Mauritshuis, with Waanders, 1990), pp. 107, 118n19. Walsh, Amy, Edwin Buijsen, and Ben Broos, eds. Paulus Potter: Paintings, Drawings, and Etchings, exh. cat. (The Hague: Mauritshuis, 1994), pp. 144-46, no. 28, ill, entry by Edwin Buijsen. Jaffé, David. Summary Catalogue of European Paintings in the J. Paul Getty Museum (Los Angeles: J. Paul Getty Museum, 1997), p. 98, ill.
Fredericksen, Burton B., et al. Masterpieces of the J. Paul Getty Museum: Paintings (Los Angeles: J. Paul Getty Museum, 1997), p. 65, no. 35, ill., entry by Dawson Carr. The J. Paul Getty Museum Handbook of the Collections. 6th ed. (Los Angeles: J. Paul Getty Museum, 2001), p. 124, ill.
Stafford, Barbara Maria, and Frances Terpak, eds. Devices of Wonder: From the World in a Box to Images on a Screen, exh. cat. (Los Angeles: Getty Research Institute, 2001), p. 369, no. 50. Sluijter, Eric Jan. "'All striving to adorne their houses with costly peeces': Two Case Studies of Paintings in Wealthy Interiors." In Art & Home: Dutch Interiors in the Age of Rembrandt, exh. cat. Mariet Westermann, ed. (Denver: Denver Art Museum, with Waanders, 2001), pp. 110-11, 230n47, ill.
Allen, Denise, et al. Masterpieces of Painting in the J. Paul Getty Museum. Rev. ed. (Los Angeles: J. Paul Getty Museum, with Thames & Hudson, 2003), p. 61, no. 32, ill., entry by Dawson Carr. Biesboer, Pieter, et al., eds. Nicolaes Berchem: In het licht van Italië, exh. cat. (Haarlem: Frans Halsmuseum, with Ludion, 2006), pp. 86, 164n51. Ripps, Michael J. "Bond Street Picture Dealers and the International Trade in Dutch Old Masters, 1882-1914." Ph.D. diss. (University of Oxford, 2010), pp. 47, 47n48, 107, 107n93, 220, fig. 49. Wolloch, Nathaniel. The Enlightenment's Animals: Changing Conceptions of Animals in the Long Eighteenth Century (Amsterdam: Amsterdam University Press, 2019), pp. 212-13, fig. 21.